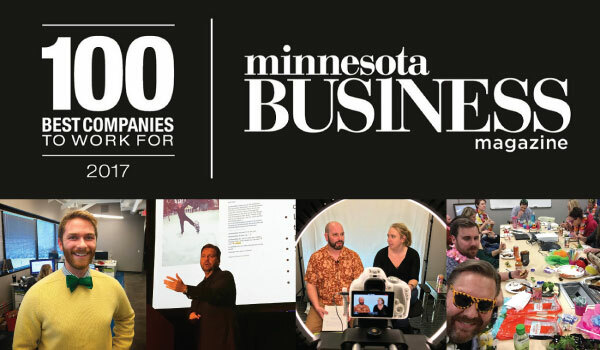 Each year, Minnesota Business magazine publishes a list of “100 Best Companies to Work For”. In order to be considered for this prestigious award, the company must first be nominated. Then, anonymous online questionnaires are filled out by employees of each participating company and are tallied, resulting in the final list. The award spans a variety of areas including, environment, employee benefits and overall employee happiness. Everyone wants to work for an amazing company. But the truth of the matter is, not everyone has this opportunity. To help professionals find a company that is the right fit for them, Minnesota Business Magazine has come up with a resource for job seekers and job posters alike. We’re pleased to announce that TopRank Marketing was included on the list of top companies, for the second year in a row. The great thing about this recognition is that it was based on feedback from our own team. But don’t take our word for it, see what they have to say about their experience at TopRank Marketing. What do you enjoy most about working at TopRank Marketing? More Good News – We’re Hiring! Located in Minneapolis, Minnesota, TopRank Marketing is home to a group of smart, creative and results-focused marketing professionals that you might just have to call “well above average”. Included on our team are some of the top account management professionals, marketing consultants, technical wizards, insightful analysts and clever creatives from across North America.